Many brewers are going wild with the experimentation and imperialization and barreling-aging of stouts these days, but interestingly, there seems to be an unstated consensus that porters are to be kept humble. Part of this is the interchangeable nomenclature between porters and stouts — if there's no consensus definition that makes a porter a porter, and you decide to take your recipe a bit over the top, I think most people will instinctively call that a stout. Likewise, if it feels like a porter, you call it a porter. Relatively sessionable, a little more malty; smooth and straightforward. Once I style that I overlooked, I've since come to really appreciate the porter's humble nature. I could have probably gotten away with calling this brew a stout, but rye stout doesn't sound as good as rye porter, and I wanted this to drink like a porter. So a porter it is; who's going to know? So, as you may have guessed, this batch didn't involve any crazy experimentation — it was instead the rare occasion where I returned to a fairly basic concept/recipe to work on perfecting it. The main question going into this batch was simply how much rye to use, and of course, what sort of ratio of dark malts would get me closest to that perfect chocolate/coffee flavor I love (without actually using chocolate or coffee). Should I use enough rye malt to officially call it a "rye porter," or should I simply brew a porter that happens to have some rye for mouthfeel? Should I try out chocolate rye malt, or keep the chocolate and the rye separate? One year previous, I brewed the first iteration of my rye porter, with both recipes simply based on whatever I thought sounded good at the time. Both have come out well, but that first iteration had a bit too much of the dank earthy dark malt character I associate with baltic porters, and plus the bottles over-carbonated. This second batch is a nice improvement over the first round, and excepting a few minor issues, extremely close to the ideal humble porter I was shooting for. Carbonation is on the low side — which is stylistically fine — but leads to a spritzy head that's gone within moments. With two pounds of oats and one pound of chocolate rye malt, this definitely doesn't lack mouthfeel, but once the head is gone, the beer utterly still, and could use more liveliness, even for a porter. Rye is generally great for head retention, so where the hell did it go here? This doesn't really affect the flavor much — other than feeling flat after a few minutes — but it's really confusing me. Do some brands of oats contain head-killing oils? I would love to hear some thoughts on what might be causing this. But beyond the lack of head, the mouthfeel is how I like it for a porter, decadent and oily. One of my "ventures" for this was to try out chocolate rye malt instead of regular rye malt, and so much as I can pick it out from everything else (as in, I can't), I like it. But I'm once again leaning toward making this a rye-heavy porter, so next time I'll probably use plain old rye in a larger percentage, and sub out the oats for a pound of chocolate wheat malt (gotta get that head retention back). With a body rich in chocolate and coffee nuances, and really nicely balanced between sweet and rich and dry and roasty, this batch has great balance, yet it's not a balance that comes at the expense of complexity. Rye and Munich do their thing without the cloying sweetness of crystal malts, and roasted barley offers those wonderful coffee / chocolate flavors without nudging the beer too far in either the dry or sweet direction. Perfecting a beer recipe is a lot like that math problem where you shoot an arrow that covers exactly 50% of the distance each time, and therefore, eventually, gets imperceptibly closer without ever actually reaching the target — though it may appear to, from your perspective. There are a handful of perfect beers out there, perhaps, but almost anything can be improved... marginally. I doubt I will brew the same porter recipe twice until I have tried a dozen more combinations, taking into account a dozen other variables like water profile and yeast selection. I could brew this to a higher final gravity, and increase the bitterness to compensate. I could try to amp up the rye character, or even see what a larger, crazy percentage of chocolate rye malt would do. I could toss in some oak chips next time, and I just might. But for now, what I have is a very nice porter, and I like that quite a bit. Sounds tasty. I love that Yorshire yeast. I also made a rye beer with it last year, though it was a brown. That yeast does well with rye and also dark beers. I'm trying 22% (1.5kg in 20 l) flaked rye in a strong amber ale with Brett Trois and Galaxy hops next weekend. Wish me luck. Nice! That Trois rye beer should be tasty. I've thought about doing my next one with a big percentage of rye instead of the wheat I usually use. Good luck, curious to hear how it turns out! 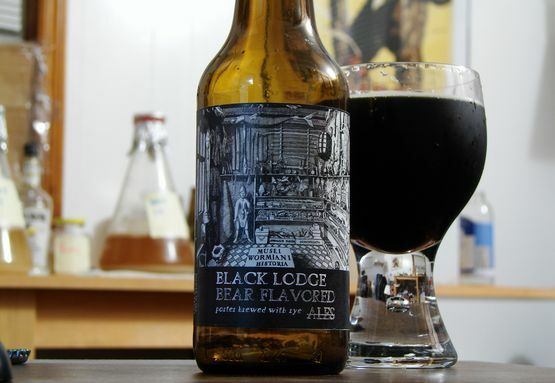 Hi there Bear Flavored, great posting and I returned to it for inspiration in designing my next porter! First off, o love the grain bill, and secondly, I can certainly see where the rye went. Chocolate rye malt, I feel, doesn't have so much of the delicate, grainy, earthy flavors that rye offers to a brewer... I'm very in touch with them, essentially everything from Danish sourdough to Finnish ruisleippa to brownies that I bake is rye, and I just brewed a Szechuan pepper roggenbier last week - I'd suggest switching maybe an eighth to a quarter of the base malt with rye malt and then switch out your flaked oats with flakes rye! This I found in the grocery stores here, and I just used rågflingor for making rye porridge, and it turned out so awesomely. Anyways, thanks for sharing this beauty of a porter! Loved your idea with rosemary in the secondary on your first batch. The porter I'm brewing will use a touch of rye malt and possibly a touch of acid malt for, but I'm following Mikkeller's grain bill for Mexas and Texas Ranger, my favorite porters on the market. Viscous, creamy, a little smoky, perfect chocolate to roast ratio. So: Maris otter and rye base, a touch of acid or smoke malt, crystal 60, chocolate, brown, and finally, roasted barley. Toasted pumpkin seeds in the end of the boil and in secondary, fresh cranberries in primary, very balanced modest hop schedule but still present - centennial and Columbus for bittering, saaz or hersbrucker at 5, Columbus and centennial whirlpool. Ringwood ale I'm thinking for yeast to prep it for a rye Barleywine with Chinook and Columbus, and rye whiskey barrel aging. Fun stuff! Point is, adding way more straight rye and using chocolate wheat is a very good idea. Gives a smooth chocolate flavor and not much of that heavy roastiness. If it works the same for as it did for me, you should get a pretty creamy head that lasts super long.